Tor Books. Hardcover. POOR. Noticeably used book. Heavy wear to cover. Pages contain marginal notes, underlining, and or highlighting. Possible ex library copy, with all the markings/stickers of that library. Accessories such as CD, codes, toys, and dust jackets may not be included. Doherty Associates, LLC, Tom, 1995. Hardcover. Very Good. Disclaimer:A copy that has been read, but remains in excellent condition. Pages are intact and are not marred by notes or highlighting, but may contain a neat previous owner name. The spine remains undamaged. The dust jacket is missing. At ThriftBooks, our motto is: Read More, Spend Less. Doherty Associates, LLC, Tom, 1995. Hardcover. Acceptable. Disclaimer:A readable copy. All pages are intact, and the cover is intact. Pages can include considerable notes-in pen or highlighter-but the notes cannot obscure the text. The dust jacket is missing. At ThriftBooks, our motto is: Read More, Spend Less. Doherty Associates, LLC, Tom, 1995. Hardcover. Good. Disclaimer:A copy that has been read, but remains in clean condition. All pages are intact, and the cover is intact. The spine may show signs of wear. Pages can include limited notes and highlighting, and the copy can include previous owner inscriptions. At ThriftBooks, our motto is: Read More, Spend Less.Dust jacket quality is not guaranteed. Doherty Associates, LLC, Tom, 1995. Hardcover. Good. Disclaimer:A copy that has been read, but remains in clean condition. All pages are intact, and the cover is intact. The spine may show signs of wear. Pages can include limited notes and highlighting, and the copy can include previous owner inscriptions. The dust jacket is missing. At ThriftBooks, our motto is: Read More, Spend Less. Doherty Associates, LLC, Tom, 1995. Hardcover. Acceptable. Disclaimer:A readable copy. All pages are intact, and the cover is intact. Pages can include considerable notes-in pen or highlighter-but the notes cannot obscure the text. At ThriftBooks, our motto is: Read More, Spend Less.Dust jacket quality is not guaranteed. Doherty Associates, LLC, Tom, 1995. Hardcover. Good. Disclaimer:A copy that has been read, but remains in clean condition. All pages are intact, and the cover is intact. The spine may show signs of wear. Pages can include limited notes and highlighting, and the copy can include previous owner inscriptions. An ex-library book and may have standard library stamps and/or stickers. At ThriftBooks, our motto is: Read More, Spend Less.Dust jacket quality is not guaranteed. Tor Books. Hardcover. 0312930402 Hardcover in dust jacket, minor wear to jacket, binding tight, a nice copy! . Very Good. 1995. 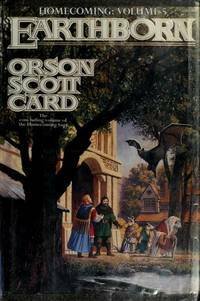 Tor Books, 1995-05-01. Hardcover. Very Good. Tor Books. Collectible - Like New. First edition copy. Collectible - Like New. Like New dust jacket. In protective mylar cover. Tor Books. Used - Like New. Like New condition. Like New dust jacket. Volume 5. Tor Books. Used - Good. Good condition. Good dust jacket. Volume 5. Slightly dampstained. Tor Books, 1995-05-01. Hardcover. VeryGood. 9.4000 inches 6.4000 inches. First Edition / First Printing as identified with ""1"" in the full number line. Signed, in Brodart plastic. New York, New York, U.S.A.: Tor Books/Tom Doherty, 1995. First Edition. Hard Cover. Very Good/Very Good. 8vo - over 7¾" - 9¾" tall. New York: Tor. 1995. First Edition. Hardcover. 0312930402 . 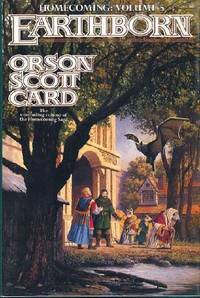 Very Good in Very Good dust jacket; When the children of Harmony return to Earth, they find a much-altered world in which two intelligent races challenge the humans, while Shedemei and the Oversoul set out to find the Keeper of Earth. ; Homecoming Saga; Vol. 5; 378 pages . 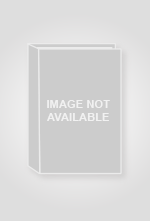 Tor Books, 1995/05/01 00:00:00.000. Hardcover . Good. 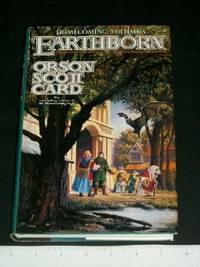 Card,Orson Scott Earthborn (Homecoming,Vol 5) Edge and cover wear to dust jacket. Creased dust jacket. Edge and cover wear to book. All Orders Shipped With Tracking And Delivery Confirmation Numbers. Tor Books, 1995-05. Hardcover. Good. Tor Books, May 1995. Hardcover. Good - Cash/No Jacket. Minor rubbing and edge wear to cover, with light reader wear to pages. Still great condition. Secure pages, solid binding. Unmarked pages. Rubbing to cover. Stock photos may not look exactly like the book.